In the summer of 1993 while bowling in our summer league, a gentleman approached me from Florence, AL, his name was Dave Smith. He introduced himself as a representative for The National Bowling Association (TNBA) for North Alabama. As he looked out over the league he asked if we knew anything about The National Bowling Association (TNBA). I told him I was sure some of the members of the league knew a little about the organization but would be willing to learn more. That conversation led to him meeting with the league and other interested bowlers. After meeting with Mr. Smith and listening to his TNBA presentation the Ebony Club was formed. We started with 20 local bowlers. Mr. Smith joined and encouraged some of the Florence, Alabama bowlers to join as well. He and the Florence, Alabama bowlers already had membership in TNBA. But they did not have enough people (60) to form a Senate. Therefore, joining the club benefited us all. We participated in various activities to generate additional membership to reach our goal. We had bowling activities, community activities, and tournament activities. As a bowling club we participated in our first TNBA activity. Because a majority of the members had TNBA membership cards we could do this. It was the 1993 Southern Regional Tournament in Memphis, TN., and we had approximately 5 teams, both male and female. It was an experience for many of us who had never bowled in a tournament setting before. As for me it was a thrilling experience to see a bowling center filled to capacity with our own ethnic group in the majority bowling. Although Huntsville is a very advanced city, it was a big departure from what we were use to seeing at our local bowling centers, and when we attended both WIBC and ABC National Tournaments during any squad time. Some of our bowlers even placed for the first time and won cash money. It was indeed a rewarding experience. Geographically, we are part of the Southern Region in the TNBA family. The Southern Region consists of states, from Texas to Florida. So you can see going to a Regional Tournament was an experience. As time went by our membership grew. Alabama TNBA representative, Mrs. Jackie Bishop and Southern Region Representative, Mr. Wayde Broughton, met with us several time to discuss TNBA Senate status. Mr. Dave Smith continued working in his area to secure members for the common goal of having a Senate in North Alabama. 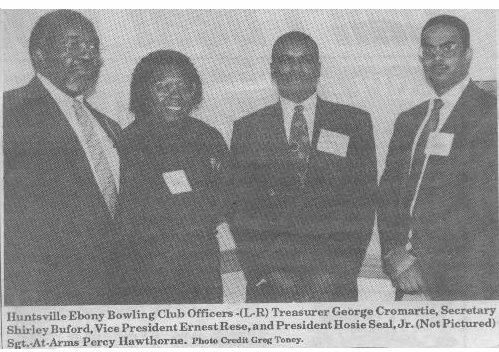 Finally in January 1994, with the membership of the Ebony Club and TNBA members from Florence, AL we surpassed the number (60) needed to apply for chartership to TNBA. On February 26, 1994 the first North Alabama Senate charted. Since a majority of the members lived in the Huntsville, Alabama area and the city is known nationwide as the Space & Rocket City, we decided to call our charted Senate, "Rocket City Bowling Senate". The Ebony Club still exists but it does not have any major activity ongoing. The Ebony Club has worked with the Senate to secure bowling towels for the Senate. The latest thing they have done is to purchased ballpoint pins with the Senate’s name embossed. As you can see the Ebony Club was and is still the cornerstone of The Rocket City Bowling Senate. Today the Senate consists of over 100 members. We are proud to say that we are striving to follow TNBA ideals of what sportsmanship, fellowship, and friendship is all about. Our motto is "Bowling Together in One Harmony". 100+ Membership, In-house awards, Community Outreach program, Expansion of the Junior Bowling Program, Mentor Program, and Major and Minor Tournaments. The Millennium has arrived and one of our goals was to have a Web Page and we have arrived at that. We now turn our site on a Membership of 200+ individuals and to host the Southern Regional Tournament. We share in the vision of our parent body, a commitment to continued growth, service to our members, and the preservation of our reputation as a world class sports organization, now and in the future.